Mgahinga National park is approximately 10 hours’ drive from Kampala the capital city of Uganda. The park is located in the far southwestern region of Uganda, sharing the Virunga Mountains with Rwanda and Congo. Wake up to a hearty breakfast and drive off to Mgahinga National Park. The drive is approximately 10hrs but so much interesting with a number of exciting sightseeing. Make a stopover at the Equator monument, take photography, proceed through Mbarara town, you can probably have late lunch in kabale town. Check into your lodge upon arrival and be treated to a tasty dinner and overnight stay as well. After your breakfast, head to the park headquarters for a briefing before embarking on the gorilla trekking experience. You will follow the rangers as directed into the forest to search for these big apes. 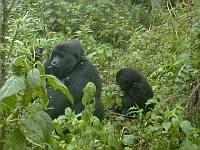 There is only one habituated gorilla group in Mgahinga forest. After tracking, drive to Lake Bunyonyi for an afternoon boat ride. You can enjoy the rest of the day at Lake Bunyonyi as you relax while having a panoramic view of the many islands dotted on this lake. Have your diner and overnight stay your preferred lodge. Wake up to an early breakfast and hope on board for a drive back to Kampala. Enjoy an enroute lunch and numerous stops as you may wish, if you have a late flight on this day, I advise you do very few stops to catch up with the flight.